Presenting the culture of our country through dancing and drumming. 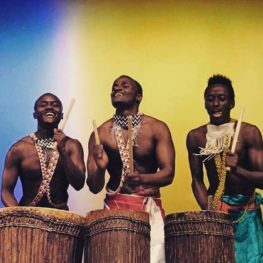 Rwandan dances are the dances of heroes, performed by men, and the drums. Imbedded with symbolism, the music is an integral part of Rwandan ceremonies, festivals, social gatherings, and storytelling. Drums are of great importance, and engender respect throughout the country. The stories told through drumming and dance are of power and victory and are performed to impress the king and the kingdom.